United States and Italy qualified to World Women 2015. All teams progress to 1/4 Finals. SPAIN: Laura Ester, Marta Bach, Anna Espar 2, Roser Tarrago, Matile Ortiz, Jennifer Pareja 1, Lorena Miranda, Pilar Pena 1, Andrea Blas, Ona Meseguer, Carmen Garcia 2, Laura Lopez, Patricia Herrera (GK). Head coach: Miguel Oca. CANADA: Nicola Colterjohn, Krystina Alogbo, Katrina Monton 1, Alexa Tielmann, Monika Eggens 1, Emma Wrigth, Joelle Bekhazi 1, Axelle Crevier, Carmen Eggens 1, Christine Robinson 1, Elyse Lemay-Lavoie, Shae Fournier, Jessica Gaudreauit (GK). Head coach: Guy Baker. AUSTRALIA: Lilan Hedges, Eliesha Browne, Hannah Buckling 2, Jayde Appel, Bronte Halugan, Bronwen Knox 3, Rowie Webster 4, Glencora McGhie 1, Bronte Colenso 1, Ashleigh Southern, Jessica Zimmerman, Keesja Gofers 1, Kelsey Wakefield (GK). Head coach: Greg McFadden. BRAZIL: Oliveira Tess, Cecilia Canetti, Marina Zablith, Marina Canetti, Lucianne Barroncas, Izabella Chiappini 2, Amanda Oliveria, Luiza Carvalho, Flavia Vigna, Melani Dias 1, Viviane Bahia 1, Diana Abla 1, Victoria Chamorro. Head coach: Patrick Oaten. 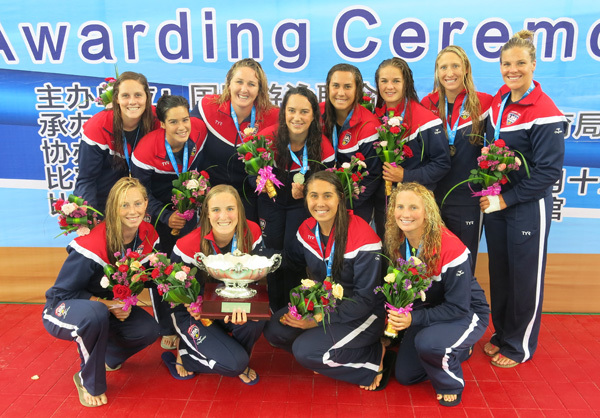 USA: Samantha Hill, Alys Williams, Melissa Seidemann, Rachel Fattal 1, Caroline Clark, Maggie Steffens 3, Makenzie Fischer, Kiley Neushul 2, Jillian Kraus, Kaleigh Gilchirst, Annike Dries, Kameryn Craig, Elizabeth Keeve (GK). Head coach: Adam Krikorian. RUSSIA: Anastasia Verkhoglyadova, Olga Trotskaya, Ekaterina Prokofyeva 1, Elvina Karimova 2, Kseniia Krimer 1, Valeriia Kolmakova, Nadezhda Iarondaykina, Evgeniia Khokhriakova 1, Anna Timofeeva, Anna Grineva 1, Evgeniya Ivanova, Ekaterina Zelentsova, Anna Karnaukh (GK). Head coach: Mikhail Nakoriakov. ITALY: Giulia Gorlero, Federica Radicchi, Arianna Garibotti 1, Elisa Queirolo, Silvia Motta 5, Rosaria Aiello, Tania di Mario 1, Roberta Bianconi 3, Guilia Emmolo 1, Valeria Palmieri 1, Aleksandra Cotti, Teresa Frassinetti, Laura Teani (GK). Head coach: Fabio Conti. CHINA: Yang Jun, Li Shulin, Liu Ping 1, Sun Yujun 2, Yiong Dunhan, Sun Yating, Song Donglun 1, Zhang Cong 2, Zhao Zihan 3, Tian Jianing, Wang Xinyan, Niu Guangnan, Peng Lin (GK). Head coach: Rick Azevedo. USA: Samantha Hill, Alys Williams 4, Melissa Seidemann 1, Rachel Fattal 2, Caroline Clark, Maggie Steffens, Makenzie Fischer 2, Kiley Neushul 2, Jillian Kraus, Kaleigh Gilchirst 1, Annike Dries 3, Kameryn Craig 1, Elizabeth Keeve (GK). Head coach: Adam Krikorian. ITALY: Giulia Gorlero, Federica Radicchi 1, Arianna Garibotti 2, Elisa Queirolo 1, Silvia Motta 1, Rosaria Aiello 1, Tania di Mario 1, Roberta Bianconi 3, Guilia Emmolo 2, Valeria Palmieri, Aleksandra Cotti, Teresa Frassinetti 1, Laura Teani (GK). Head coach: Fabio Conti. BRAZIL: Oliveira Tess, Cecilia Canetti, Marina Zablith 2, Marina Canetti, Lucianne Barroncas, Izabella Chiappini 3, Amanda Oliveria, Luiza Carvalho, Flavia Vigna, Melani Dias, Viviane Bahia, Diana Abla, Victoria Chamorro. Head coach: Patrick Oaten. SPAIN: Laura Ester, Marta Bach, Anna Espar, Roser Tarrago, Matile Ortiz, Jennifer Pareja 7, Lorena Miranda, Pilar Pena 1, Andrea Blas 1, Ona Meseguer, Carmen Garcia 3, Laura Lopez, Patricia Herrera (GK). Head coach: Miguel Oca. RUSSIA: Anastasia Verkhoglyadova, Olga Trotskaya 1, Ekaterina Prokofyeva 3, Elvina Karimova 1, Kseniia Krimer, Valeriia Kolmakova, Nadezhda Iarondaykina 4, Evgeniia Khokhriakova 1, Anna Timofeeva, Anna Grineva, Evgeniya Ivanova 1, Ekaterina Zelentsova 1, Anna Karnaukh (GK). Head coach: Mikhail Nakoriakov. AUSTRALIA: Lilan Hedges, Eliesha Browne 1, Hannah Buckling 2, Jayde Appel 1, Bronte Halugan, Bronwen Knox 1, Rowie Webster 5, Glencora McGhie, Bronte Colenso, Ashleigh Southern 3, Jessica Zimmerman, Keesja Gofers 1, Kelsey Wakefield (GK). Head coach: Greg McFadden. CHINA: Yang Jun, Li Shulin, Liu Ping 1, Sun Yujun 1, Yiong Dunhan, Sun Yating 2, Song Donglun 1, Zhang Cong 1, Zhao Zihan 2, Tian Jianing, Wang Xinyan, Niu Guangnan, Peng Lin (GK). Head coach: Rick Azevedo. ITALY: Giulia Gorlero, Federica Radicchi 2, Arianna Garibotti 1, Elisa Queirolo 1, Silvia Motta, Rosaria Aiello, Tania di Mario 3, Roberta Bianconi 3, Guilia Emmolo 1, Valeria Palmieri, Aleksandra Cotti, Teresa Frassinetti, Laura Teani (GK). Head coach: Fabio Conti. AUSTRALIA: Lilan Hedges, Eliesha Browne, Hannah Buckling, Jayde Appel 1, Bronte Halugan, Bronwen Knox 1, Rowie Webster 3, Glencora McGhie 3, Bronte Colenso, Ashleigh Southern 1, Jessica Zimmerman, Keesja Gofers 1, Kelsey Wakefield (GK). Head coach: Greg McFadden. SPAIN: Laura Ester, Marta Bach, Anna Espar, Roser Tarrago 1, Matile Ortiz, Jennifer Pareja 2, Lorena Miranda, Pilar Pena, Andrea Blas, Ona Meseguer, Carmen Garcia 1, Laura Lopez 1, Patricia Herrera (GK). Head coach: Miguel Oca. USA: Samantha Hill, Alys Williams, Melissa Seidemann 1, Rachel Fattal 1, Caroline Clark 1, Maggie Steffens, Makenzie Fischer, Kiley Neushul 2, Jillian Kraus, Kaleigh Gilchirst 2, Annike Dries 1, Kameryn Craig, Elizabeth Keeve (GK). Head coach: Adam Krikorian. CANADA: Nicola Colterjohn, Krystina Alogbo 1, Katrina Monton 1, Alexa Tielmann, Monika Eggens 2, Emma Wright 1, Joelle Bekhazi 3, Axelle Crevier 1, Carmen Eggens 3, Christine Robinson 1, Elyse Lemay-Lavoie, Shae Fournier 1, Jessica Gaudreauit (GK). Head coach: Guy Baker. RUSSIA: Anastasia Verkhoglyadova, Olga Trotskaya, Ekaterina Prokofyeva 2, Elvina Karimova 1, Kseniia Krimer, Valeriia Kolmakova, Nadezhda Iarondaykina 3, Evgeniia Khokhriakova, Anna Timofeeva 1, Anna Grineva 1, Evgeniya Ivanova 3, Ekaterina Zelentsova 1, Anna Karnaukh (GK). Head coach: Mikhail Nakoriakov. CHINA: Yang Jun, Li Shujin 1, Liu Ping, Sun Yujun 2, Yiong Dunhan, Sun Yating 1, Song Donglun 1, Zhang Cong 1, Zhao Zihan 2, Tian Jianing, Wang Xinyan 1, Niu Guangnan, Peng Lin (GK). Head coach: Rick Azevedo. BRAZIL: Oliveira Tess, Cecilia Canetti, Marina Zablith, Marina Canetti 2, Lucianne Barroncas, Izabella Chiappini 1, Amanda Oliveria, Luiza Carvalho 1, Flavia Vigna, Melani Dias 2, Viviane Bahia, Diana Abla, Victoria Chamorro. Head coach: Patrick Oaten. CANADA: Nicola Colterjohn, Krystina Alogbo 3, Katrina Monton, Alexa Tielmann, Monika Eggens 1, Emma Wright, Joelle Bekhazi 1, Axelle Crevier, Carmen Eggens, Christine Robinson 1, Elyse Lemay-Lavoie, Shae Fournier 1, Jessica Gaudreauit (GK). Head coach: Guy Baker. AUSTRALIA: Lilan Hedges, Eliesha Browne, Hannah Buckling, Jayde Appel 2, Bronte Halugan, Bronwen Knox, Rowie Webster 4, Glencora McGhie, Bronte Colenso, Ashleigh Southern, Jessica Zimmerman, Keesja Gofers 2, Kelsey Wakefield (GK). Head coach: Greg McFadden. USA: Samantha Hill, Alys Williams 1, Melissa Seidemann, Rachel Fattal, Caroline Clark, Maggie Steffens 3, Makenzie Fischer 1, Kiley Neushul 3, Jillian Kraus, Kaleigh Gilchirst 2, Annike Dries, Kameryn Craig 1, Elizabeth Keeve (GK). Head coach: Adam Krikorian. BRAZIL: Oliveira Tess, Cecilia Canetti, Marina Zablith, Marina Canetti, Lucianne Barroncas, Izabella Chiappini 1, Amanda Oliveria, Luiza Carvalho, Flavia Vigna, Melani Dias, Viviane Bahia, Diana Abla, Victoria Chamorro. Head coach: Patrick Oaten. RUSSIA: Anastasia Verkhoglyadova, Olga Trotskaya, Ekaterina Prokofyeva 1, Elvina Karimova 2, Kseniia Krimer, Valeriia Kolmakova, Nadezhda Iarondaykina 1, Evgeniia Khokhriakova 1, Anna Timofeeva, Anna Grineva, Evgeniya Ivanova, Ekaterina Zelentsova, Anna Karnaukh (GK). Head coach: Mikhail Nakoriakov. ITALY: Giulia Gorlero, Federica Radicchi, Arianna Garibotti 1, Elisa Queirolo, Silvia Motta, Rosaria Aiello 1, Tania di Mario 1, Roberta Bianconi 2, Guilia Emmolo 1, Valeria Palmieri, Aleksandra Cotti, Teresa Frassinetti, Laura Teani (GK). Head coach: Fabio Conti. SPAIN: Laura Ester, Marta Bach, Anna Espar 3, Roser Tarrago, Matile Ortiz, Jennifer Pareja, Lorena Miranda, Pilar Pena 3, Andrea Blas, Ona Meseguer, Carmen Garcia 2, Laura Lopez, Patricia Herrera (GK). Head coach: Miguel Oca. CHINA: Yang Jun, Li Shujin 1, Liu Ping, Sun Yujun 2, Yiong Dunhan, Sun Yating 3, Song Donglun 1, Zhang Cong, Zhao Zihan 1, Tian Jianing, Wang Xinyan, Niu Guangnan 1, Peng Lin (GK). Head coach: Rick Azevedo. SPAIN: Laura Ester, Marta Bach, Anna Espar, Roser Tarrago 2, Matile Ortiz 3, Jennifer Pareja 1, Lorena Miranda, Pilar Pena, Andrea Blas 4, Ona Meseguer 2, Carmen Garcia 2, Laura Lopez 5, Patricia Herrera (GK). Head coach: Miguel Oca. RUSSIA: Anastasia Verkhoglyadova, Olga Trotskaya 2, Ekaterina Prokofyeva 1, Elvina Karimova 1, Kseniia Krimer, Valeriia Kolmakova, Nadezhda Iarondaykina, Evgeniia Khokhriakova, Anna Timofeeva, Anna Grineva, Evgeniya Ivanova 2, Ekaterina Zelentsova, Anna Karnaukh (GK). Head coach: Mikhail Nakoriakov. CANADA: Nicola Colterjohn, Krystina Alogbo, Katrina Monton, Alexa Tielmann, Monika Eggens, Emma Wright, Joelle Bekhazi, Axelle Crevier, Carmen Eggens 4, Christine Robinson 3, Elyse Lemay-Lavoie, Shae Fournier 1, Jessica Gaudreauit (GK). Head coach: Guy Baker. BRAZIL: Oliveira Tess, Cecilia Canetti, Marina Zablith, Marina Canetti, Lucianne Barroncas, Izabella Chiappini 3, Amanda Oliveria, Luiza Carvalho 1, Flavia Vigna, Melani Dias 1, Viviane Bahia, Diana Abla, Victoria Chamorro. Head coach: Patrick Oaten. AUSTRALIA: Lilan Hedges, Eliesha Browne, Hannah Buckling, Jayde Appel, Bronte Halugan, Bronwen Knox, Rowie Webster 2, Glencora McGhie 2, Bronte Colenso, Ashleigh Southern, Jessica Zimmerman, Keesja Gofers, Kelsey Wakefield (GK). Head coach: Greg McFadden. USA: Samantha Hill, Alys Williams 1, Melissa Seidemann, Rachel Fattal 3, Caroline Clark 1, Maggie Steffens 2, Makenzie Fischer 2, Kiley Neushul 2, Jillian Kraus 1, Kaleigh Gilchirst, Annike Dries, Kameryn Craig 1, Elizabeth Keeve (GK). Head coach: Adam Krikorian. CHINA: Yang Jun, Li Shujin, Liu Ping, Sun Yujun 3, Yiong Dunhan, Sun Yating 1, Song Donglun 1, Zhang Cong 2, Zhao Zihan, Tian Jianing 1, Wang Xinyan, Niu Guangnan, Peng Lin (GK). Head coach: Rick Azevedo. ITALY: Giulia Gorlero, Federica Radicchi 1, Arianna Garibotti 1, Elisa Queirolo 2, Silvia Motta, Rosaria Aiello, Tania di Mario 1, Roberta Bianconi 2, Guilia Emmolo 2, Valeria Palmieri, Aleksandra Cotti, Teresa Frassinetti, Laura Teani (GK). Head coach: Fabio Conti. RUSSIA: Anastasia Verkhoglyadova, Olga Trotskaya, Ekaterina Prokofyeva, Elvina Karimova, Kseniia Krimer, Valeriia Kolmakova 1, Nadezhda Iarondaykina 2, Evgeniia Khokhriakova, Anna Timofeeva, Anna Grineva 3, Evgeniya Ivanova 2, Ekaterina Zelentsova, Anna Karnaukh (GK). Head coach: Mikhail Nakoriakov. BRAZIL: Oliveira Tess, Cecilia Canetti, Marina Zablith 3, Marina Canetti, Lucianne Barroncas, Izabella Chiappini 3, Amanda Oliveria, Luiza Carvalho 1, Flavia Vigna, Melani Dias, Viviane Bahia, Diana Abla, Victoria Chamorro. Head coach: Patrick Oaten. SPAIN: Laura Ester, Marta Bach 1, Anna Espar, Roser Tarrago 1, Matile Ortiz, Jennifer Pareja 3, Lorena Miranda, Pilar Pena 1, Andrea Blas 1, Ona Meseguer, Carmen Garcia, Laura Lopez 1, Patricia Herrera (GK). Head coach: Miguel Oca. CANADA: Nicola Colterjohn, Krystina Alogbo, Katrina Monton, Alexa Tielmann, Monika Eggens 1, Emma Wright 2, Joelle Bekhazi 2, Axelle Crevier, Carmen Eggens, Christine Robinson, Elyse Lemay-Lavoie 1, Shae Fournier 1, Jessica Gaudreauit (GK). Head coach: Guy Baker. CHINA: Yang Jun, Li Shujin, Liu Ping, Sun Yujun, Yiong Dunhan, Sun Yating 1, Song Donglun, Zhang Cong, Zhao Zihan 1, Tian Jianing, Wang Xinyan, Niu Guangnan, Peng Lin (GK). Head coach: Rick Azevedo. AUSTRALIA: Lilan Hedges, Eliesha Browne, Hannah Buckling, Jayde Appel 2, Bronte Halugan, Bronwen Knox, Rowie Webster 2, Glencora McGhie 1, Bronte Colenso, Ashleigh Southern 1, Jessica Zimmerman, Keesja Gofers, Kelsey Wakefield (GK). Head coach: Greg McFadden. ITALY: Giulia Gorlero, Federica Radicchi 1, Arianna Garibotti 1, Elisa Queirolo, Silvia Motta, Rosaria Aiello, Tania di Mario 2, Roberta Bianconi 3, Guilia Emmolo 1, Valeria Palmieri, Aleksandra Cotti, Teresa Frassinetti, Laura Teani (GK). Head coach: Fabio Conti. USA: Samantha Hill, Alys Williams, Melissa Seidemann 1, Rachel Fattal 3, Caroline Clark, Maggie Steffens 3, Makenzie Fischer, Kiley Neushul 1, Jillian Kraus, Kaleigh Gilchirst 1, Annike Dries 1, Kameryn Craig, Elizabeth Keeve (GK). Head coach: Adam Krikorian.